The church that I attend to is pretty big that majority of the members have to park off site in this structure near a business area. So from there, we take the school bus that the church provides and then they take us to and from church in less than 5 minutes. Last Sunday, I ended up being the only one on the bus to go back to the parking structure. During the bus ride, I decided to strike up a conversation with the bus driver, Luis, about how his new year celebration was since it was the first Sunday of 2013. He shared with me how he spent time with his family and ate good food. From there, I told him how I liked tres leches which is a Mexican sponge cake soaked in three different kinds of milk. When you see the cake, you think that you’re about to bite into a normal cake because you barely see a drip of the milk. But. Once you bite into it, you experience the tres leches. It’s amazing. He told me that there’s something better than tres leches called rosca. He was telling me that it’s a pastry that you pull the bread apart with your hands. I can’t remember how he described it to me but I remember thinking, “I must find rosca!” I asked him where I could find some rosca and he suggested some places in Santa Ana because that’s where all the authentic Mexican food is at. He said that he could bring some rosca the next Sunday. So today was the next Sunday! And guess what. Luis remembered! Well, the thing is. He didn’t bring rosca because bakeries only make them for the holidays and up until January 6th. Basically, I have to wait until next year to get some rosca. 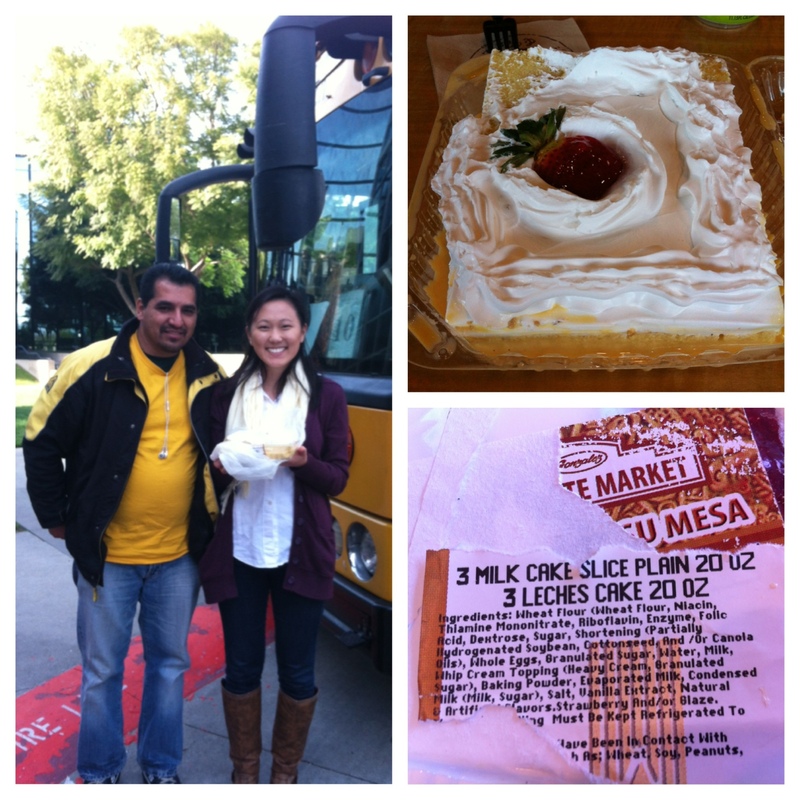 So instead of rosca, he brought tres leches! He gave me a big slice of it! I was really surprised that he still brought something. I told him that in return, I’ll bring him some kind of Korean pastry. Not sure sure what kind of pastry I’ll bring next week or maybe I’ll give him some kim-bop. Suggestions? Luis was so kind that I just had to take a picture with him for memories! Also, thank you to Dasom for coming with me to meet Luis. Lastly, thank you to Jessica Paz! I remember you invited me to your mom’s birthday slash Mother’s Day celebration at your house in high school. It was my first time trying tres leches then and there.